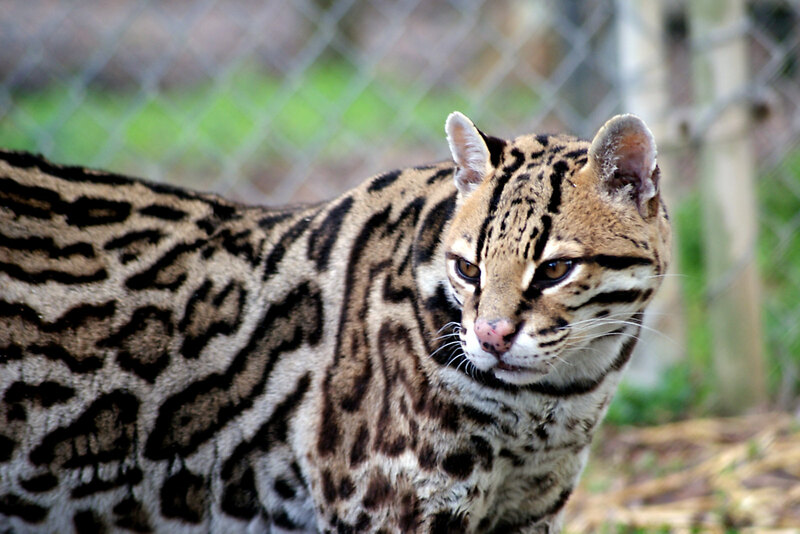 Oliver is a quiet ocelot who enjoys sleeping his days away and coming out to explore at night. Loud noises and big trucks make Oliver nervous so he lives away from the tour path. Keepers and volunteers have to earn his trust before he will come out to greet them; even then, he comes out only when he feels like it. Oliver enjoys tearing up enrichment boxes and spraying them with his scent to remind everyone that it belongs to him. Oliver was born as part of Carolina Tiger Rescue’s former breeding program. Carolina Tiger Rescue, formerly Carnivore Preservation Trust, was originally founded to breed keystone species in hopes of one day releasing them into a safe environment but that day never came. The animals who were born here will remain here for life. Oliver enjoys living in a quiet part of the sanctuary away from the tour path. He loves to come out at night and stalk prey that wanders or slithers into his enclosure. Oliver, like all ocelots, is very quick and able to catch unsuspecting snakes. Oliver is primarily active at night and sleeps about 90% of the day. He is by far our biggest ocelot and, though a little overweight, his size is mostly due to being very big boned. Oliver loves fruit-scented water and enjoys exploring a high platform that was built for him by one of our summer interns. Oliver takes pain medication for arthritis because he is on the older side. Oliver is located next to Magoo Ocelot in Elm Grove away from the tour path. In the late 1990s, Carolina Tiger Rescue, formerly Carnivore Preservation Trust, decided that we were no longer going to breed due to the number of accredited facilities that were abiding by the Species Survival Plan. The Species Survival Plan was set up to ensure that breeding in captivity is only being done to conserve a species. This helps limit needless breeding and prevents a surplus of animals living in captivity. Carolina Tiger Rescue only supports breeding in captivity if it is done in accordance with the Species Survival Plan.